Big thanks to the awesome Dianna Ippolito for taking the photograph. Check out the short article from the Phoenix New Times in anticipation of the screening at the Frank Lloyd Wright Taliesin West Foundation. 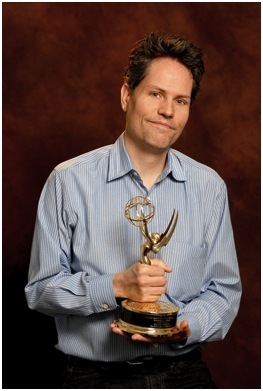 The Rocky Mountain Southwest Chapter of the National Academy of Television Arts & Sciences awarded the movie with an Emmy® in the Cultural Documentary category. I was totally surprised and completely honored. 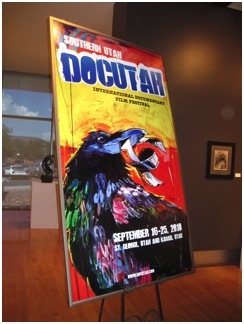 The movie won Best Editing at DocUtah: The Southern Utah International Documentary Film Festival over the weekend! I had a great screening and the staff of the festival was really wonderful. 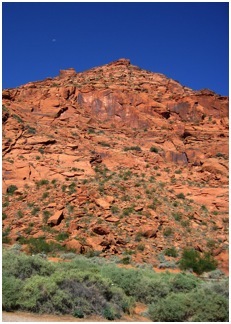 St. George, Utah is surrounding by beautiful red rocks (it’s near Zion Canyon National Park) and there was a great turnout. 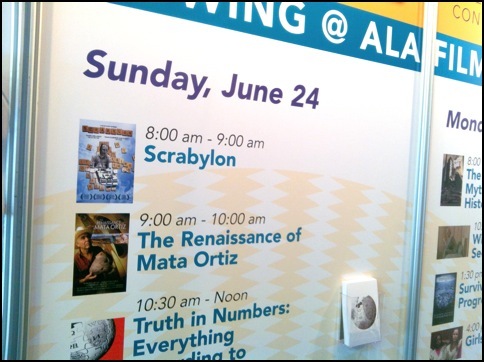 I had a screening of two of my documentaries at the American Library Association’s annual conference in Orange County. Spreading the word to librarians around the country! I took a (too) short trip to Mata Ortiz to visit a few folks over the long weekend. Unfortunately, Juan wasn’t around. ..............Spencer MacCallum in the mountains overlooking the village. 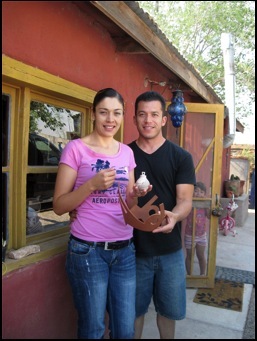 ...........................Artists Carla and Diego Valles (with daughter Regina hiding). .........................Artists Laura Bugarini and Hector Gallegos, Jr...........,........................................Associate Producer Diana Acosta and me at lunch. Holy Cow! This weekend, the movie won a whole slew of accolades at the Archaeology Channel International Film Festival in Eugene, Oregon! Award-winning artist Diego Valles, featured prominently in the movie, has a new website that features lots of his amazing work. The movie sold out two(!) 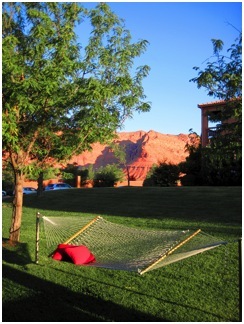 screenings at the Sedona International Film Festival and was given the Directors’ Choice Award for Best Arts Film! How awesome is that? BTW, the festival is extremely well-run and a ton of fun. I encourage everyone to visit the festival and the beautiful surrounding areas. Want to take a week workshop with the master? Learn more here. 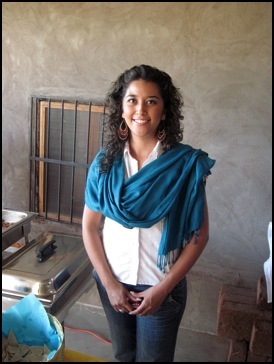 Go to the screenings page to find out where you can see The Renaissance of Mata Ortiz. 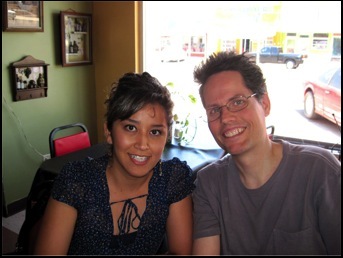 One of the most talented (not to mention one of the nicest) husband-and-wife teams in Mata Ortiz has a new website. 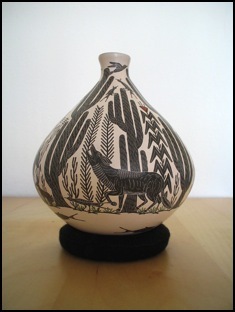 Check out all of the awesome pottery at www.hectorylauramataortizpottery.com. Check out this interactive map of Mata Ortiz! 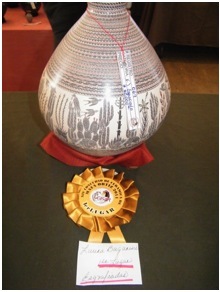 Now you can find where several potters live in the village without wandering aimlessly. Or just download the pdf below. Great Turnout in San Diego! Wow, the response at the screening at the San Diego Museum of Man was amazing! The staff had to bring in extra seats. I was happy to see lots of friends from San Diego (and even LA-thanks for driving all the way down Donna, Herman and Victoria). 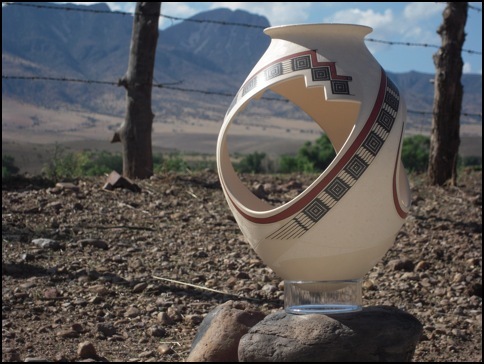 Jerry Boyd and master potter Jorge Quintana brought a ton of pots from Mata Ortiz to sell and Spencer MacCallum did a Q&A after the screening with yours truly. Thanks to Micah, Phil and the museum staff for a great event and for showing off some of Spencer’s archive that’s housed at the museum. ....... ................Grace Johnson (Museum of Man) and Spencer MacCallum.......................Jorge Quintana shows off a pot. 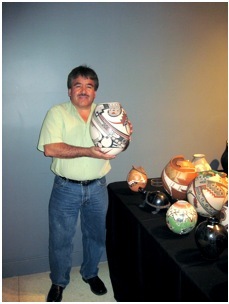 Nicolas Quezada, Juan’s brother and one of the original artists in the village, passed away today after a long illness. I will always remember the joy on his face as he described the squeaky table on which he worked for 40 years. A brilliant artist and wonderful person. 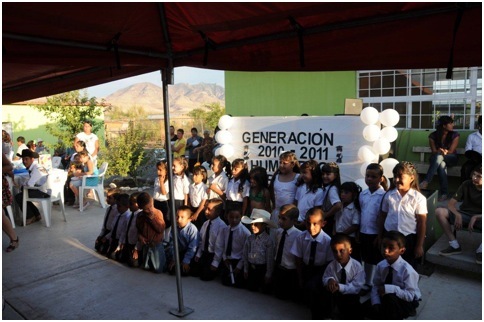 Below is the first graduation picture from the kindergarden in Mata Ortiz after the new addition to the classroom. This addition was built with donations from the Mata Ortiz Foundation. Photo courtesy of Walter Parks. 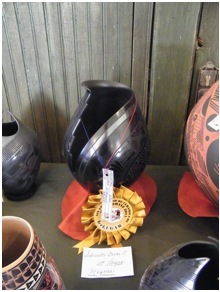 Some photos (courtesy of Grant Taggert) from recent Concurso. I took a quick trip to Mata Ortiz to see a few folks. I had a nice visit with Juan. BTW, he was happier than he looks in this picture. The sign outside his house and gallery was destroyed during a recent storm, but anyone in town will be able to direct you to his place. 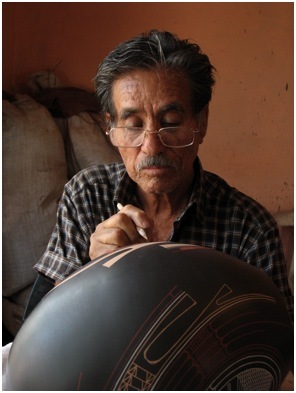 Roberto Hernandez is an incredible wood artist in Colonia Cuauthémoc, just a few miles from Mata Ortiz. He creates chairs, tables, mirrors, etc. from found wood in the mountains. Some look like animals, some like women. If anyone has some pictures of his work, please send them my way. 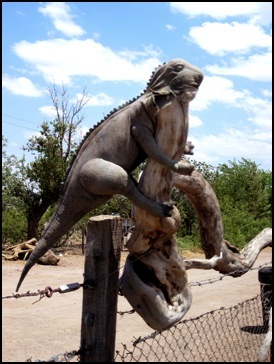 If you are driving from Casas Grandes, take the sharp right turn to Colonia Cuauthémoc (there’s a sign). Go 1.1 miles and turn right. There will be an orange house on your right. There used to be a sign for his place on the road, but someone hit it with their car or truck and dragged it all the way to Colonia Juarez. Drive a minute or two until you see his house on the right. It’s at the end of the dirt road and is easily identified. You might see his truck or a lizard. He has some loud dogs, so beep your horn if you don’t like dogs. Hopefully, he’ll be home and show you what he has for sale. He lived in the States for many years, so his English is excellent. My awesome designer, Chris St. George, just finished the poster art for The Renaissance of Mata Ortiz. Thanks to photographer Raechel Running! 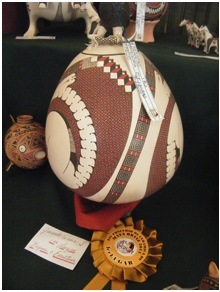 Diego Valles just won the Premio Nacional de la Juventud 2010. 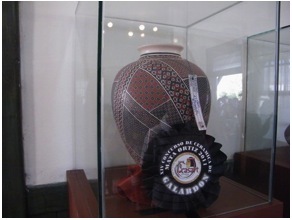 This is the highest award that the Mexican government can give to a young citizen. 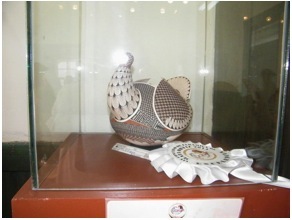 This is the same award that Juan Quezada won in 1999, except that this award is for young people. A great honor for Diego and a great tribute to the town of Mata Ortiz. Congrats, Diego!!! 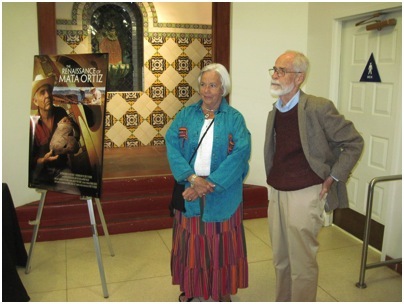 Check out The Magnetism of Mata Ortiz, a cool new book about Mata Ortiz and northern Chihuahua. 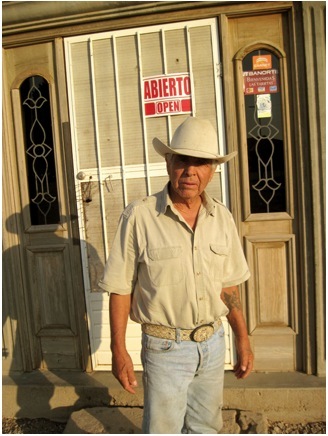 I met one of the authors, Ron Bridgemon, in Mata Ortiz and he’s filled with great stories. Get your copy today. It’s been some time since The Many Faces of Mata Ortiz and The Miracle of Mata Ortiz, so I’m happy to report that a new book about Mata Ortiz is now available. 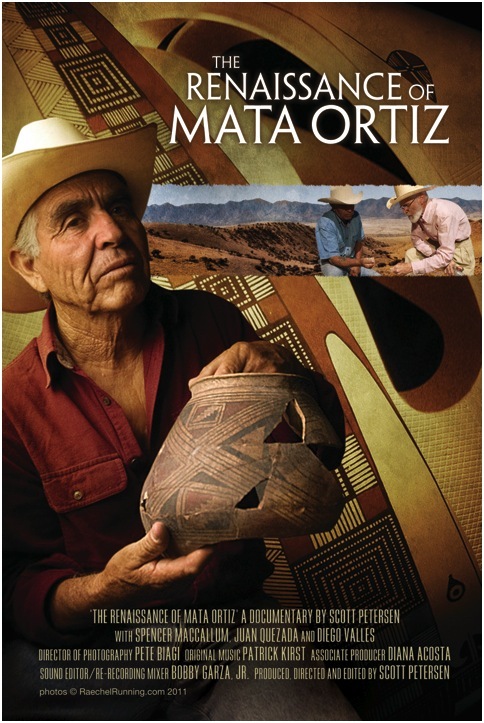 Written by John V. Bezy and Stuart D. Scott, it’s called The Artistry and History of Mata Ortiz and it even features a photo I took of Spencer MacCallum and Juan Quezada. I just ordered mine and can’t wait to get it. For more information about the book, go to: http://www.mataortizartists.com. I’m almost done! The awesome Patrick Kirst finished the score and now it’s in the hands of my audio guy, Bobby Garza, Jr. for sound editing, etc. I still have to do some assorted technical stuff to do after that, but it’s very close to being submitted to festivals. I was engaged in a nasty battle with the proper way to do the subtitles when Bouke over at the VideoToolShed came to the rescue with his SubBits subtitling software. Thanks, Bouke! If you know of any cool places (museums, independent screening facilities, universities) in your town or anywhere on the planet, please let me know and I’ll drop them a line. And a big thank you to the people who have donated to the project. Your generosity is very much appreciated. Give yourself a big hug! A quick story from Spencer MacCallum. 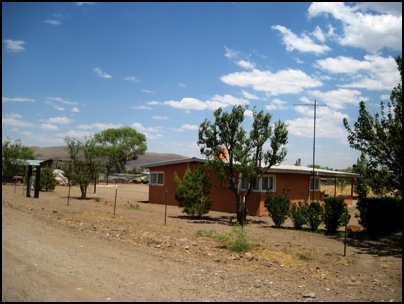 This is the story of a little church in Casas Grandes, Chihuahua, a small town in northern Mexico cradled in a rare valley in the Sierra Madres. Natural springs and the Casas Grandes River irrigate its fields and orchards. In the 17th century, Spaniards admired the fertile valley and built the town of Casas Grandes and a Franciscan mission, San Antonio de Padua de Casas Grandes. But in modern times, beginning in 1992, a prolonged drought struck the region. 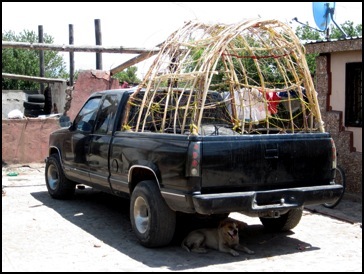 Unable to make a go of it in the absence of rainfall, people from the surrounding Sierras migrated into the valley in search of work, nearly doubling the population of Casas Grandes. 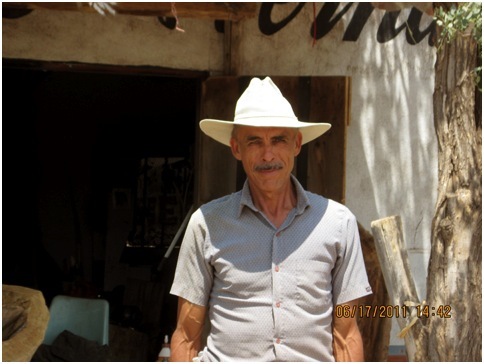 As housing spread west, Padre Antonio Quezada Valdez saw that the old church in the middle of town was no longer adequate. Another was needed, and with it a new church plaza. Wondering what sort of church to build, Padre Antonio had a dream. Instead of putting up just another modern structure, why not replicate the 350-year-old church of the now ruined Franciscan mission? He would call it El Templo del Señor de la Divina Misericordia (Temple of the Lord of Divine Mercy). Little remained of the original church, built in 1663 and destroyed in the Pueblo Indian revolt of 1680. But its plan was known because a team of archaeologists had once excavated the mission site. With a limited budget, Padre Antonio realized that he could not replicate the original size of the mission church. But he thought he could accomplish the effect on a slightly smaller scale. Sadly, the budget did not allow even that. Construction began in 1999 and continued to where services could be held, and there the funding ran out. The towers were left truncated, and no work had been done on the plaza. And so the church stood for several years, known only to its parishioners. Then a miracle began to unfold. In 2004 a local artist, Gricel Ortiz, who had trained in Italy and painted chapels there, came home to care for her aged mother. Finding the little church, she volunteered to cover the entire wall behind the altar with a mural of the Divine Mercy. At the focal end of the long nave, with perfect lighting from a clerestory, the wall offered an ideal space for a major work of art. Gricel was inspired. She filled the chapel with classical music as she painted, high on her scaffolding. Without help, she completed the mural in six days. 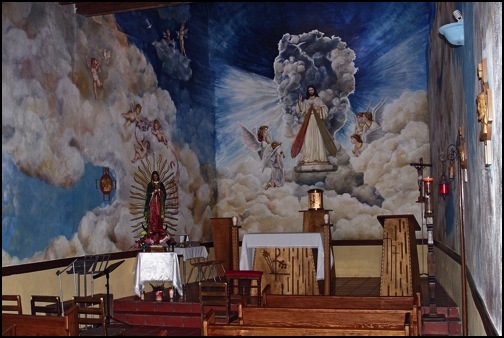 Her dream, when the padre could afford to buy materials, was to paint the whole interior of the church with a surround mural of clouds, angels, and saints so that visitors on entering the church would feel they had entered heaven. But for six years more, the church and its mural remained unfinished. 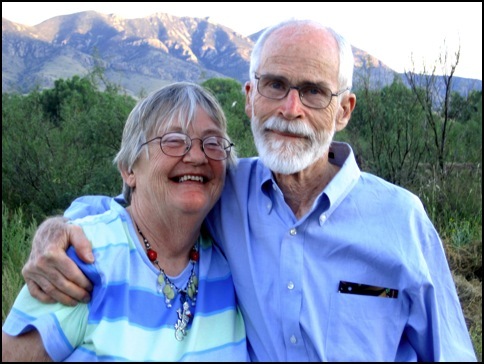 Then two Americans who had made Casas Grandes their home, Spencer and Emalie MacCallum, chanced upon the church and were struck by its story and the remarkable mural. They thought the little church and its artwork could become a major attraction for visitors. The MacCallums had renovated La Casa del Nopal near the plaza, and a guide for Grand Circle Travel, Teresa Zinser, had begun bringing her tour groups to this historic adobe. 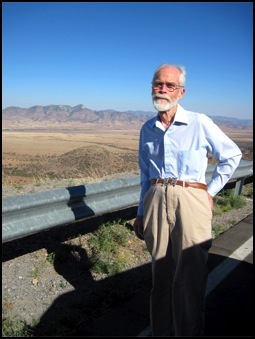 During one of these visits, Spencer boarded the bus and guided the group to the little church, explaining its story on the way. 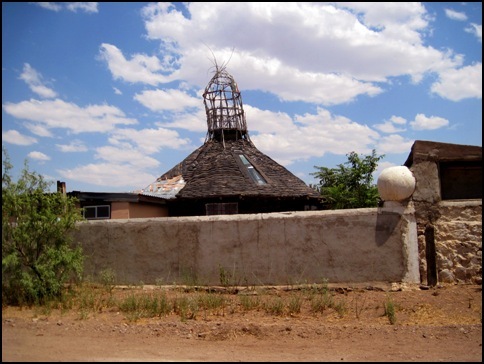 He told the tour group they would see a rare example of Chihuahua’s original style of church architecture, like that of the adobe churches of New Mexico to the north with their long, narrow nave, and he explained that the reason for the narrow nave was that the builders were limited by the trees they had to span it. He told about the mural and explained why the church was unfinished. He said this would not be for all, but if some felt inspired by the beauty they were about to see and wanted to feel a part of the project, he knew the padre would welcome it. As they left the church, he said, he would stand near the entrance with his inverted sombrero for those who freely cared to contribute. Such was the response that within months, as Teresa continued bringing groups and others joined in, construction on the church resumed, bringing employment to the neighborhood. Within the year, not only were the towers complete, Gricel had paints and materials to carry out her over-all vision for the church. One Sunday morning the following spring, April 11, 2010, First Communion was celebrated in the church with its surround mural of heaven. Following Mass, festive crowds watched Matachines dance in brilliant sunshine outside the church, their lines advancing and retreating in a pageant of color as they must have outside the original mission church more than three centuries earlier, carrying on a tradition combining pagan and Christian elements that still survives from those early times in northern Mexico and the pueblos of New Mexico. After installing professional lighting that will effectively illuminate the art work, future plans include offering concerts of string quartet and other kinds of chamber music in this unique setting. 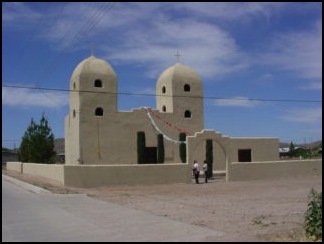 religious structures in northern Mexico. Its simplicity and spirituality will inspire many for years to come.